Will the Warriors Turn Down a Trip to the White House? If any team would publicly and collectively decide not to make the White House visit, it would be these Warriors. Jefferson’s point, of course, was that no NBA team would do a photo op in the White House as long as the space was occupied by Donald Trump. That prediction could become prophecy… but not quite yet. 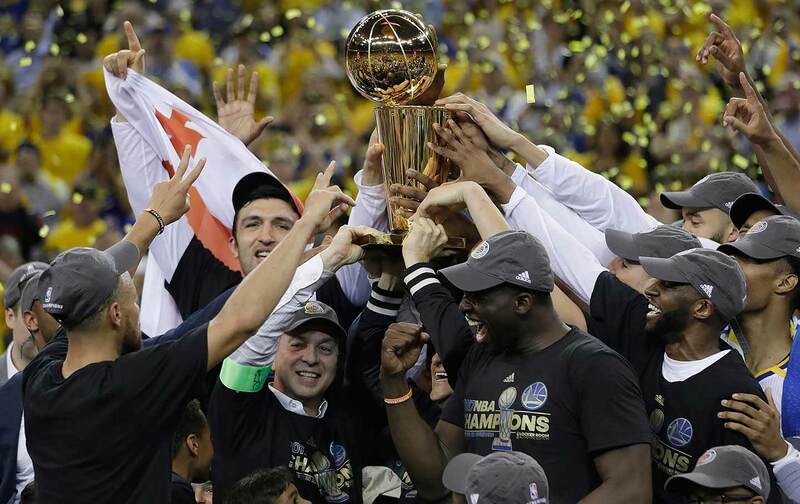 It was widely reported—following a single tweet from an unverified account—that the Golden State Warriors, amid the hoopla of winning the 2017 NBA Championship, had voted unanimously that they would not visit this White House. The idea that this could have happened so quickly, before the champagne even dried on the locker-room floor, should have strained credulity. Yet the reports circulated with viral speed and were soon treated as fact by Newsweek, Vibe, The Independent, and many other news sources and journalists blessed with the blue check mark. It moved so quickly from unsourced tweet to reality that House Democratic leader Nancy Pelosi even issued an invitation to host the team in Washington, DC, if they did not want to go to the White House. It is understandable why so many news feeds thought that this story must be true. If any team would publicly and collectively decide not to make the White House visit, it would be these Warriors. All the tactics that [Trump] used to get elected are the very things that someone like me, who works with youth on a consistent basis, are the things that we try to talk our young folks out of being. We try to talk our young people out of being bullies. We try to talk our young men out of disrespecting women. We try to talk our young people into being accepting of other people’s opinions and other people’s walks of life. The modern coach has to be much more communicative, flexible, aware, conscientious, all those things. Frankly, I think it’s why Trump couldn’t be more ill-suited to be president, because he’s a blowhard. You don’t see some of the qualities you talk about, the resilience, the ability to communicate, the compassion. None of that. Finals MVP Kevin Durant plays his politics very close to the vest, but he did appear in the much lauded Nike “Equality” ad that was a transparent response to the rise of Trumpism and a refutation of the very Islamophobia, sexism, and bigotry that has emerged from the sewers since he took office. It also has to be noted that the Warriors play in Oakland, a place that has seen a terrifying resurgence of white-nationalist organizing. Trump has pointedly not condemned this violence. These forces represent a threat to the lives and peace of mind of every person of color in the Bay Area, including basketball players whose families walk those streets. By publicly refusing to go to the White House as a team, Golden State would be following in the footsteps of the New England Patriots players who refused to go, despite the fact that their owner Bob Kraft is private-plane buddies with Trump. My belief is that it would be absolutely shocking if these Warriors did in fact visit the White House. Their refusal will be public or whether it simply won’t happen. I also do not think this Trump White House will invite them. These are not normal times, and this is not a normal president. Trump, as the media chases the implications of the latest garbled tweet, is methodically serving a hidden agenda in darkness. If sunlight is indeed the best disinfectant, then the Warriors could play a role in fumigating a White House whose scent is indeed wafting across the world.